PYEONGCHANG, South Korea, Feb. 4 (Yonhap) -- In hockey, masks for goaltenders aren't just for protection. With their faces hidden behind them during games, goalies express their unique, even artful identities through these masks. 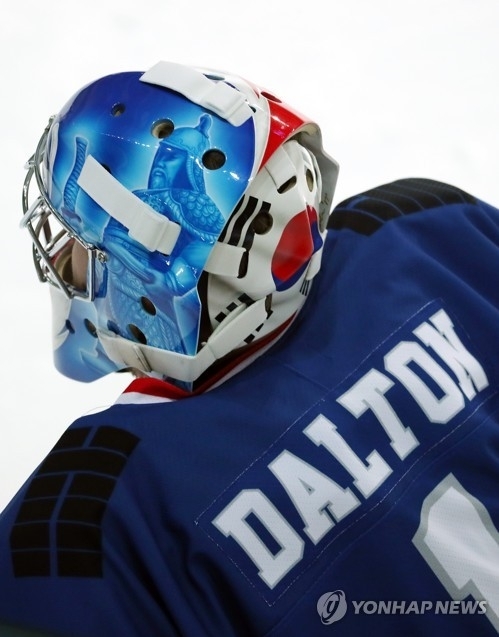 Canadian-born South Korean goalie Matt Dalton proudly wears the national flag of his adopted country at the back of his mask. And on the left side of it is the image of Admiral Yi Sun-shin, a legendary Korean naval commander from the 16th century best known for a victory over Japan in 1597. Unfortunately for Dalton, the admiral's drawing is a no-go at the PyeongChang Winter Games, as far as the International Olympic Committee (IOC) is concerned. The IOC has deemed the image political and forced Dalton to remove it, based on an article under the Olympic Charter that states, "No kind of demonstration or political, religious or racial propaganda is permitted in any Olympic sites, venues or other areas." 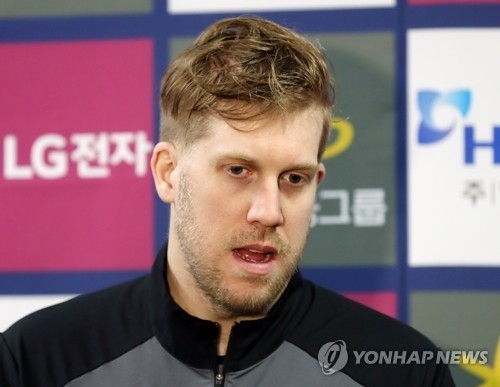 "I don't agree with it," Dalton told reporters after South Korea's 3-1 loss to Kazakhstan in an Olympic tune-up game at Seonhak International Ice Rink in Incheon, west of Seoul. "We're going to fix it so I can wear it," he added. "It's disappointing. I wanted to keep it the way it was, obviously." Dalton apparently decided to put Yi's image on his mask after seeing the admiral's statue at Gwanghwamun Plaza in Seoul. Naturalized as a South Korean in 2016, Dalton also has images of the South Korean national flag on both of his pads and his blocker. Dalton said he knew the whole story behind Yi, and he was crushed that he wouldn't get a chance to show the world how proud he was to represent South Korea. Asked how he'll remove the image, Dalton said: "I don't know. Our equipment staff is going to take care of it. We're going to fix it somehow. It's disappointing that it has to be covered up." This isn't the first time a hockey goalie has been forced to make changes to a mask. Before the 2014 Sochi Winter Olympics, U.S. women's goalie Jessie Vetter had to remove a reference from the U.S. Constitution on hers. Dalton said it only hit him a couple of weeks ago that he'll be playing in the Olympics for the first time. And altered mask or not, he can't wait to go there. "It's special. It's something that happens every four years," he said. "And to be able to be a part of it is an amazing opportunity, something I'll cherish for the rest of my life." One of South Korea's group stage opponents is Canada, world No. 1, two-time defending Olympic champion, and Dalton's native country. Though Dalton still has his family there, his focus is now on playing hard for South Korea. "I've been here a long time. This is my home now," said Dalton, who's been playing for the Korean club Anyang Halla in the Asia League Ice Hockey since 2014. "I enjoy my time here, and I am proud to represent Korea. The more I play for Korea, the more I am proud to be part of it."